I attended last week's Just For Laughs Festival press conference, at which time the 2011 summer lineup was announced. 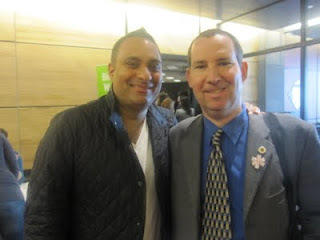 The highlight for me was meeting Canadian superstar of comedy Russell Peters (left), whom I loved watching in the motion picture Source Code. With big names and new themed galas, this summer’s Just For Laughs Festival presented by Videotron in association with Loto-Québec has the shows you need, the stars you love and the hot topics you can’t get enough of. Our Festival’s 29th edition has matured and evolved into a completely different event, complete with a bevy of brand-new shows to launch, so a typical press conference just couldn’t cut it this year. Last week, for the first time ever, fans joined the media at HaHaHa U, a one-shot comedy tutorial to share everything in store for this summer’s Festival. To accommodate their new special event Videotron Just For Laughs Galas, they have moved from the St. Denis Theatre to a new home at the illustrious Salle Wilfrid-Pelletier in Place des Arts. They have also extended anglophone programming to span from July 11 to 31, so comedy fans will have more time than ever to experience the vast array of Festival shows. For much more details log on to your local Suburban.